This is my second post for the day because the week ahead is pretty full so I won't have time to post. It seems as though 'the postings' are taking more time than the actual card creation from conception to completion! Either I am getting quicker at creating cards or my typing, photo editing, watermarking and writing skills are awfully slow. This card is for the 'Sweet 'n Sassy Digi challenge'. The challenge was to use digi images on a Z fold card. This is the inside of the card. 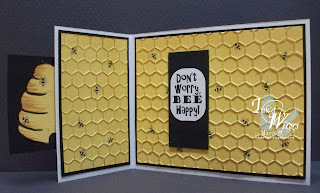 A left over scrap from the background was cut and colored to resemble a beehive and placed on the tab on the far left. 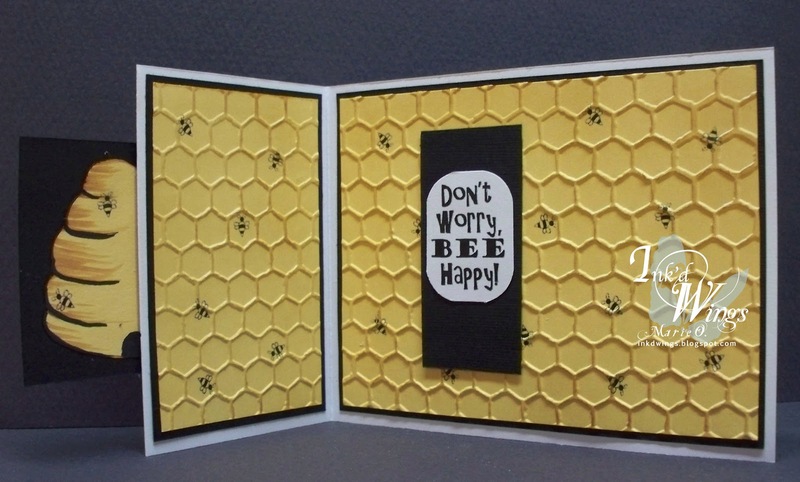 The background paper was created by resizing, scattering and turning the bee image randomly before printing on yellow/gold paper. After it was cut to size it was embossed with a Sizzix die then the raised areas were highlighted with Vintage Photo Ink applied with a piece of cut 'n dry. 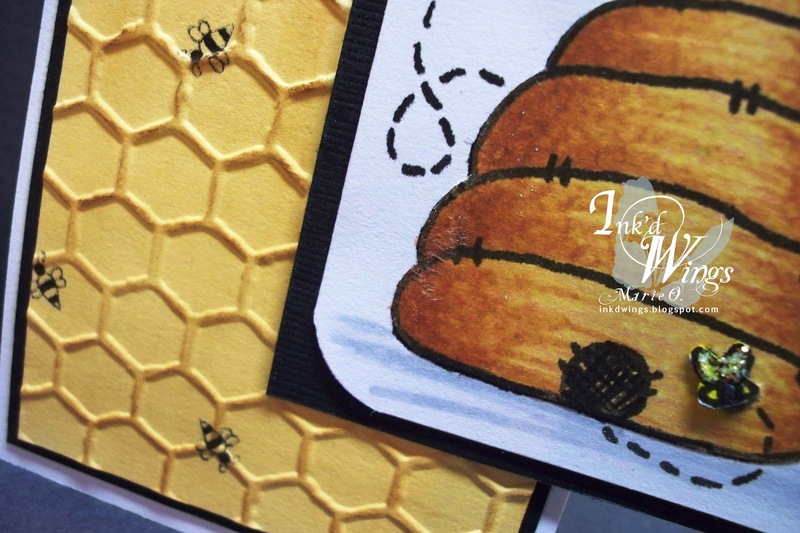 The beehive was paper pieced then highlighted with Copic markers. 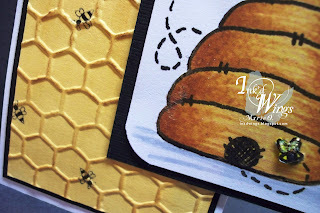 A piece of Terrycloth was used to add some texutre to the Copic coloring on the hive. A small bee was fussy cut for the front of the beehive. Stickles were added to the bumblebee wings. This is adorable, Marie! Fabulous coloring and texture. Thanks for joining the Sweet 'n Sassy Digi Challenge this week! What a great embossed background Marie...perfect for this cute image! I know what you mean about all of the photography and writing...it does take up a lot of time!! It's totally true - I have loads of cards I've never blogged. Challenge ones always make it on first so that they meet deadlines, and everything else waits patiently & hopefully gets shared before the holiday they're for, lol. Love that embossing folder - and what a cool fold! What a great card Marie,thanks for joining CCT this week! I love this one!! That's a wonderful embossing folder! Neat fold, too! Hi Marie! Hope you're doing well! Your card is adorable! 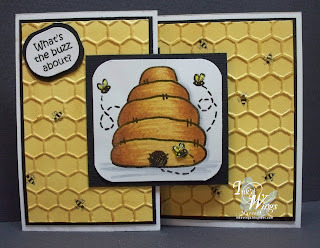 I love all that honeycomb embossing and the way you colored the image. That popped up bee on the image is super cute, too. Hope you have a great week! ~Hugs! Ohhh...what a sweet card! 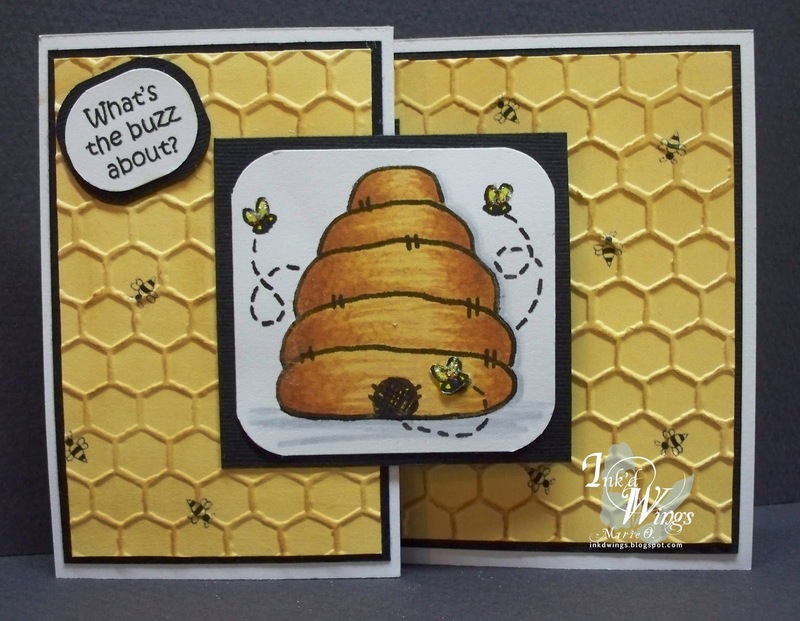 Love the honey comb die and vintage ink to highlight! Love the design with Z card, which I must try some time! A fun sweet card...love it! WOW, that's pretty. Love the embossed background. Thank you for joining us at Sweet N Sassy.